November 24, 1983: Muddied combatants pose before heading home for Thanksgiving dinner. It was a sacred tradition for a number of years, a ritual no less important to its participants than the national holiday on which it occurred. 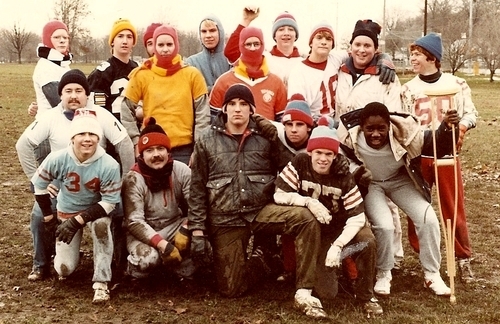 Every Thanksgiving morning at 9:00, a ragtag group of brothers and friends assembled on a frozen field at Robb Park for a spirited game of touch football. Victory with all of its bragging rights was awarded to the first team to score five touchdowns. By that time, great patches of dormant grass would be stripped away, leaving a muddy pit as testimony to the annual battle. Soaked through, sore, and grimier than any other time of the year, the players trudged home to clean up in time for heartily appreciated turkey dinners. The Turkey Bowl began as a smaller affair, nothing much more than my three older brothers and a few of their friends running some plays on Thanksgiving morning. Things changed when my brother Richard taught 7th and 8th grade math and science at his alma mater, the same Catholic school that I attended. Thus the game was transformed into a contest between two mismatched teams: the students against the Hunt brothers and their friends. Although all of my peers played on the student team, I tagged along as a member of the Hunt team by birthright. Given my athletic skills, my peers must have been delighted. As years went by and the game got bigger and bigger, so did the student team players. The age advantage enjoyed by the Hunt team was leveling out, well on its way to becoming a liability. One year during that transitional era, my brothers and I were rummaging through an overstock discount store looking for the warmest hats and gloves that we wouldn’t mind having caked with mud. To our delight, we discovered a cache of cheap football cleats. Not only did it enhance our traditional, two-block walk from our house to the park with the staccato cadence of a military march, it helped us on the field. Though the mud was a constant, a victorious Hunt team was not. Indeed, a proper defense proved to be a daunting obstacle for the Hunt team, which had often profited from distracting the opposition with strange and unpredictable formations. The Turkey Bowl was notable as much for its unconventional plays as it was for its utter lack of officiating. “Penalties? What penalties?” Ruen summarizes succinctly. He recalls a game rule that required the offensive line to count off five seconds before rushing, observing that it was never followed. When it came to the Turkey Bowl, there were few prohibitions and even less enforcement. “The adrenaline and excitement to try plays and positions that may not have been allowed on an organized team,” rhapsodizes student team player John Gillotti at the thought of some of the ploys that were well outside of regulation football. One gem involved Hunt team offensive lineman Dave Shine, who purposely fell to the ground at the start of the play, waited until his defensive counterpart dropped his guard, then sprinted forward to catch a pass as planned. Then there was the classic Roman Candle, a single-file vertical formation that dispersed all but the quarterback into wild receiver patterns. When things got really desperate, juvenile humor was occasionally effective. “My favorite play was the ‘Balls, Balls, Balls’ play,” admits Felkey,”where upon the hike we all stayed still and chanted ‘balls, balls, balls’ while covering our privates with our hands, before going out on our routes.” It may not have worked in the NFL, but it was novel and naughty enough to incapacitate a few adolescents. The Turkey Bowl continued to grow in popularity, especially as the student team began to trounce the Hunts. One year, more students showed up than there were members of the Hunt team. To even things out, one of the extra guys was handed over to play for the Hunts. I can attest to that. I had no business being on a football field, but no one ever gave me a hard time about being there. The better players ragged on each other and let the worst players alone. “It was inclusive and fun,” remembers Gillotti. “As I recall, I was always the MVP,” proclaims my brother Brian, demonstrating the swaggering confidence that was part and parcel of the experience. He describes a play in which he rushed the quarterback, tipped the ball into his own possession, and continued downfield for a touchdown. “It sounds more impressive than it was,” he adds, explaining that one of the least experienced students had been permitted to step in as quarterback on the play. Eventually, like all good things must, the Turkey Bowl came to an end. I was one of the first to bow out, leaving sometime in the late eighties, my lack of athleticism having rendered me increasingly ineffective even though I was the youngest member of the Hunt team. Others retired not long after, though some carried on for the long haul. “It was always fun playing in the mud,” recalls Richard Hunt. 3 comments on "Turkey Bowl"
Ahhhh, memories. They are all we have to comfort us in our old age. I heard rumors of the pulitzer article and I searched the web high and low. Ohhh the elgance must have been streaming at your fingers tips as you wrote this piece. Well put Mr. Hunt. If there is such a reunion, “I got Felkey”!!! Many thanks, Dave. Old Man Jeff will be shaking in his boots when he hears of this.